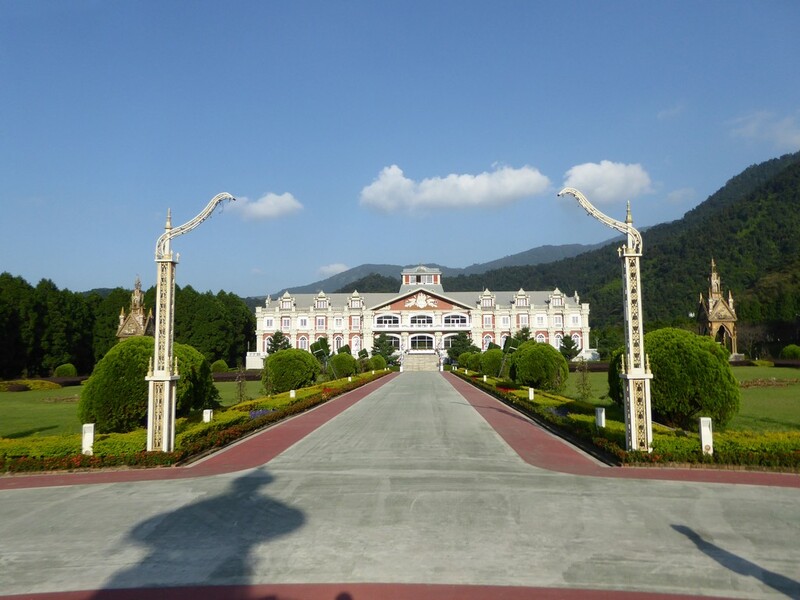 Following on the Aboriginal villages of the theme park, we come to the southern end of the Formosan Aboriginal Culture Village Amusement Isle. 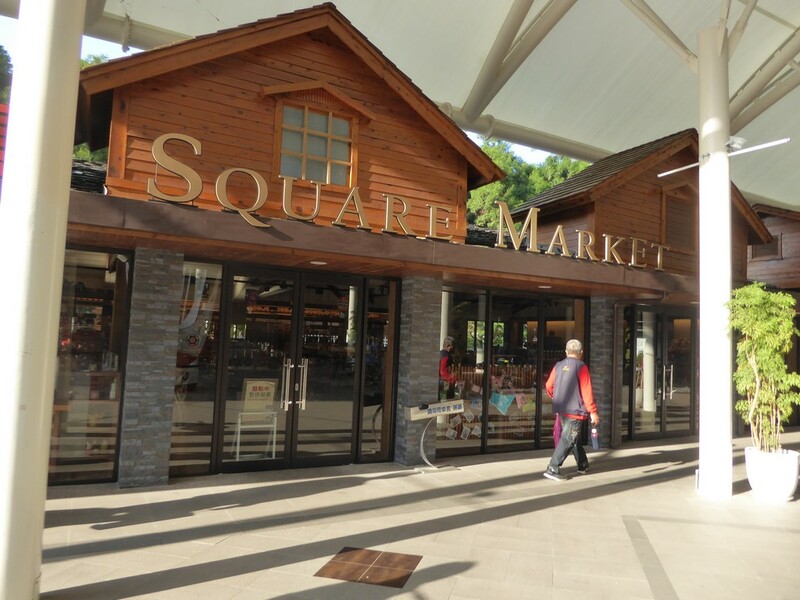 This is where all the fun and thrilling theme park rides reside. It is not long after leaving the Aboriginal section of the park where you can start hearing people screaming from rides and sounds of water splashes from wet rides. Cue the Caribbean Splash ride, a water roller coaster. 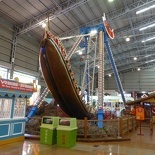 This is one of the two wet rides you can find in the amusement theme park section at the south half of the Formosan Aboriginal Culture Village. 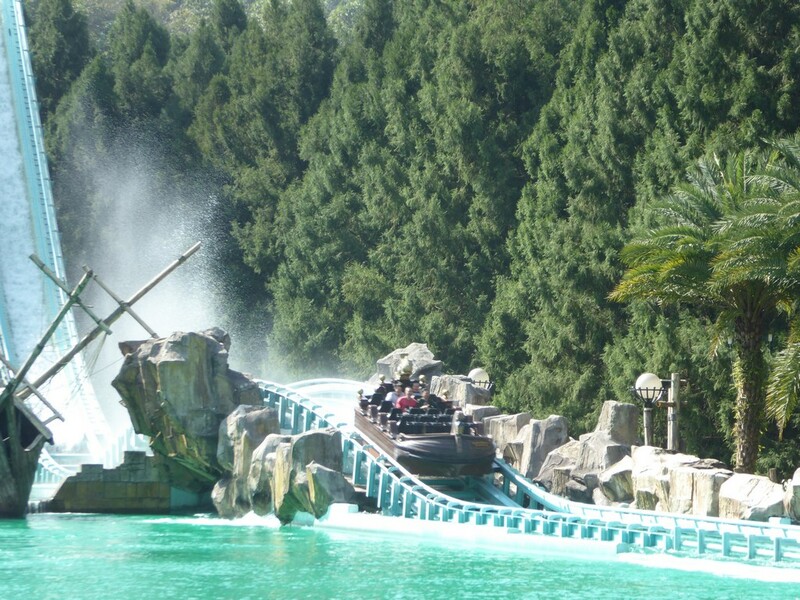 Caribbean Splash log fume final drop splash down! 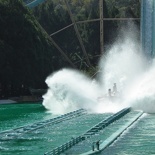 For the Caribbean Splash, ride what makes this water coaster unique is the inclusion of two turntable elements on the roller coaster tracks. The ride starts off departing the station with a traditional chain lift hill climb going into the first turntable. 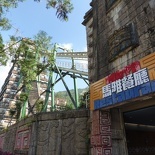 A set of hydraulic gates lock the coaster as you rotate 90 degrees and released into the first semi-drop onto a connecting adjacent track going backwards. 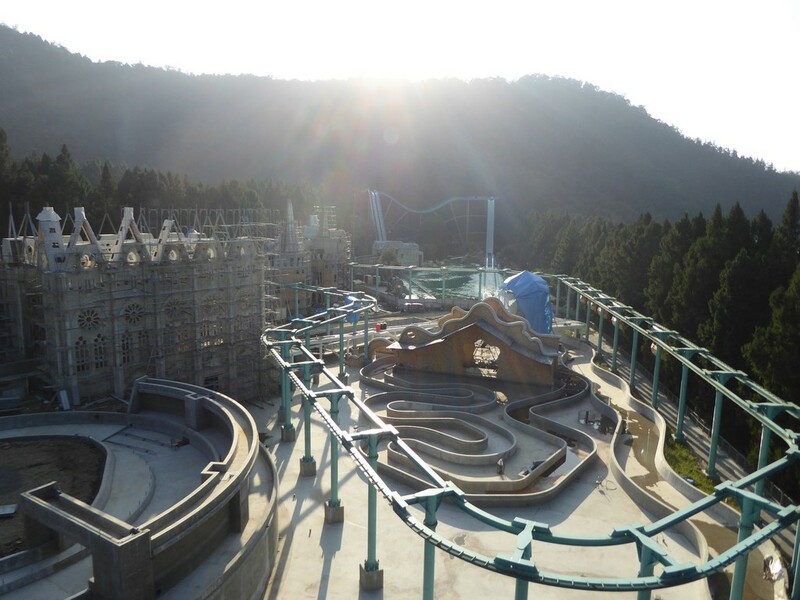 Thereafter, you enter the second gate which rotates you into the forward direction again for the main drop. 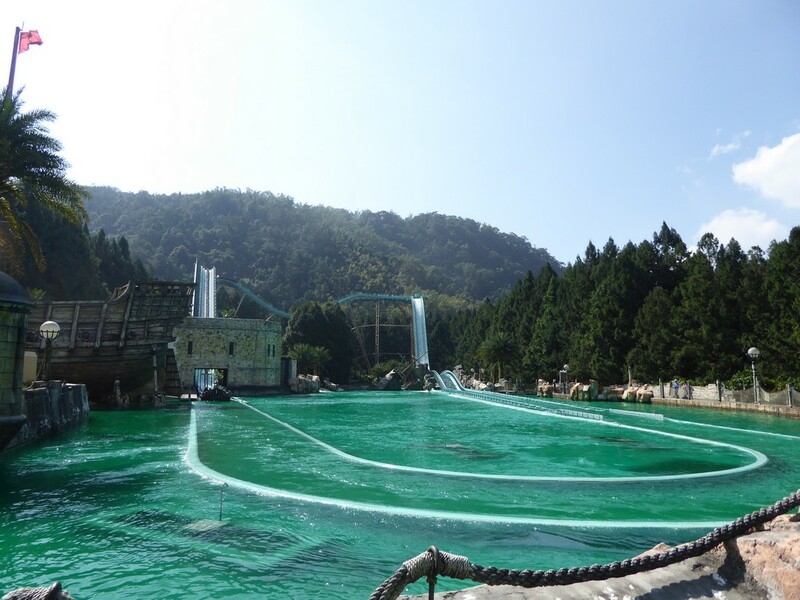 This plunge comprises firstly of a steep drop, a bunny hop and eventually into the main splash pool. 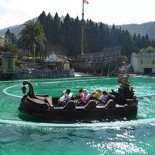 It is bound to get everyone on the ride at least minimally wet, if not soaking. 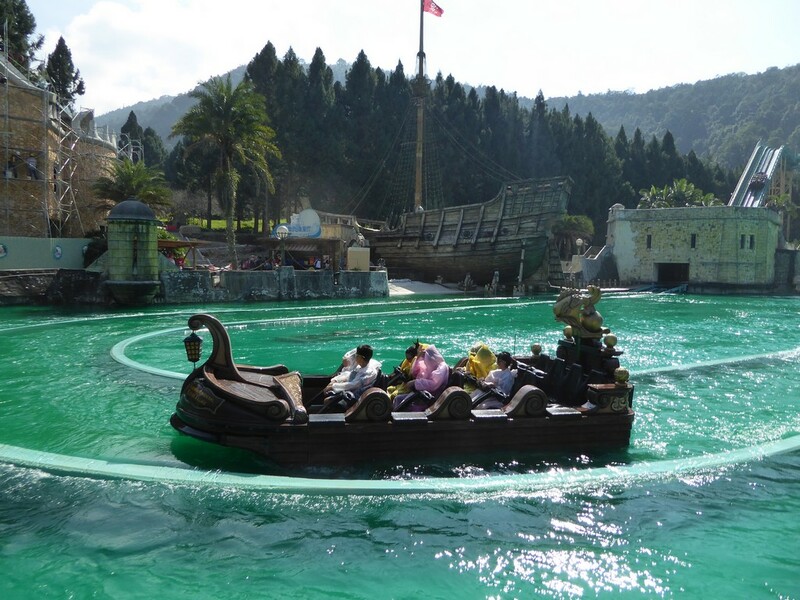 The key to not being wet is to sit at the center rear of the ride, with the wettest spot on the front and edges of the boat where water can ingress. Additionally, just when you though the ride was over, the journey back to the station is met with several “Cannonball” splashes. Notably here, jets of water shoot up skywards as your boat nears the firing spot. There are three of such spots in total simulating cannonball landing fire, complete with sound effects, a neat touch. Also, it is worth noting people sitting at the edges/sides of the boat are again more susceptible to getting wet here. Moreover, the park is well labeled with signs surround by several nice manicured planters and lawns all around this sector of the park. During my visit, the park is undergoing a major addition to the park with an elevated monorail ride and a fairy tale castle in the midst of construction. 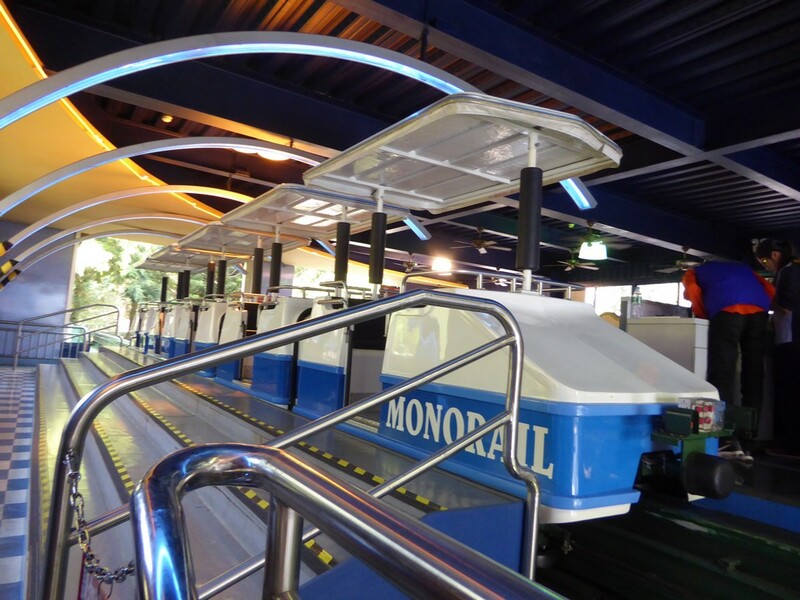 The new monorail ride has its tracks seen encircling the Splash pool area. 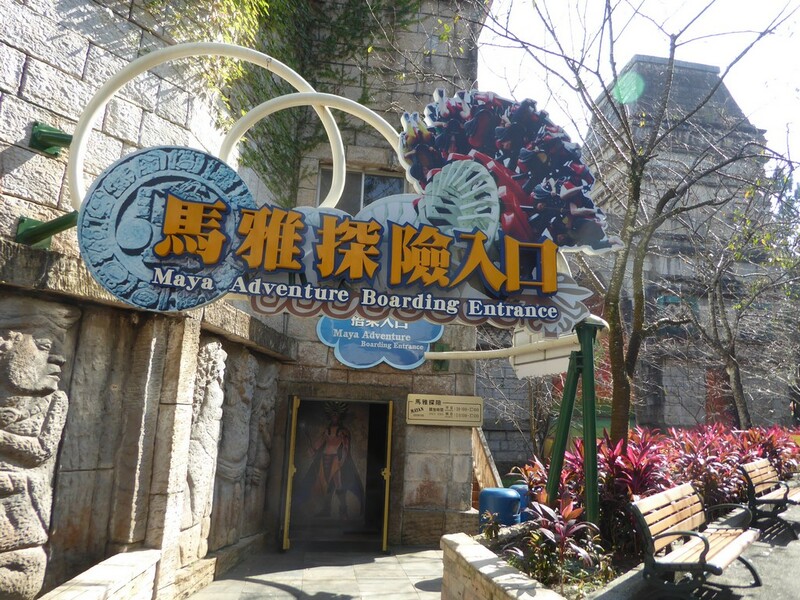 In addition, not too far off from the Caribbean Splash ride is the Mayan adventure roller coaster. This Vekoma Inverted roller coaster is easily my favorite ride in the entire park. 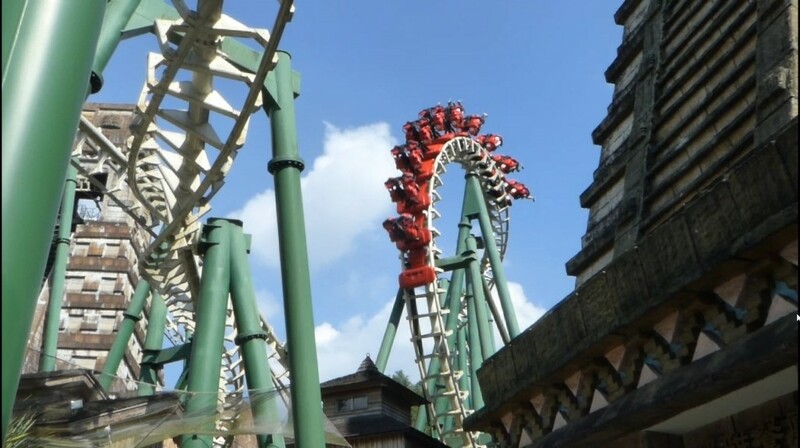 An inverted roller coaster is one where the tracks run above the roller coaster train itself. Hence, riders here are trapped suspended with their legs hanging below the train cars. However, unlike most large inverted coasters, the ride is rather discreet and quiet too. 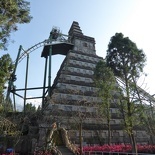 Visually, most of its tracks, with the exception of the initial hill-lift are all hidden from view by surrounding trees and the extensive Mayan Pyramid theming. 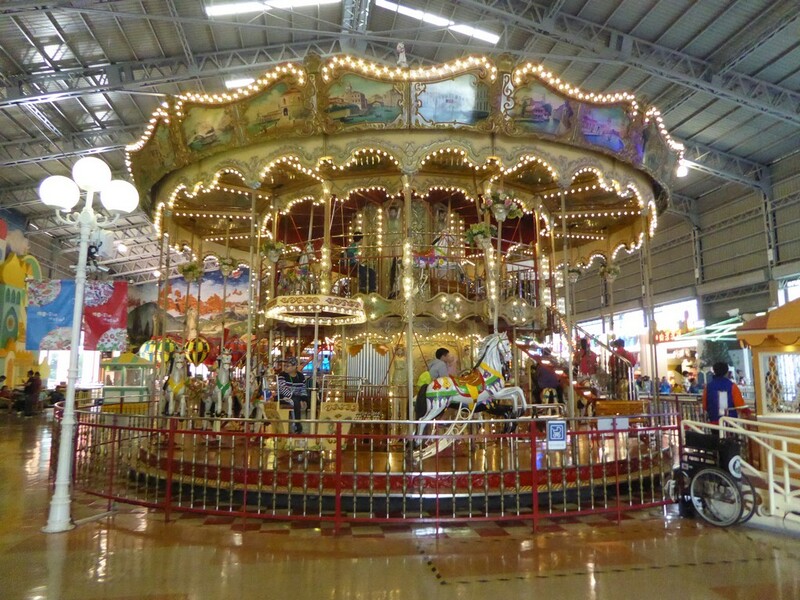 Thus, you can’t tell whether the ride is operating by hearing it from afar. 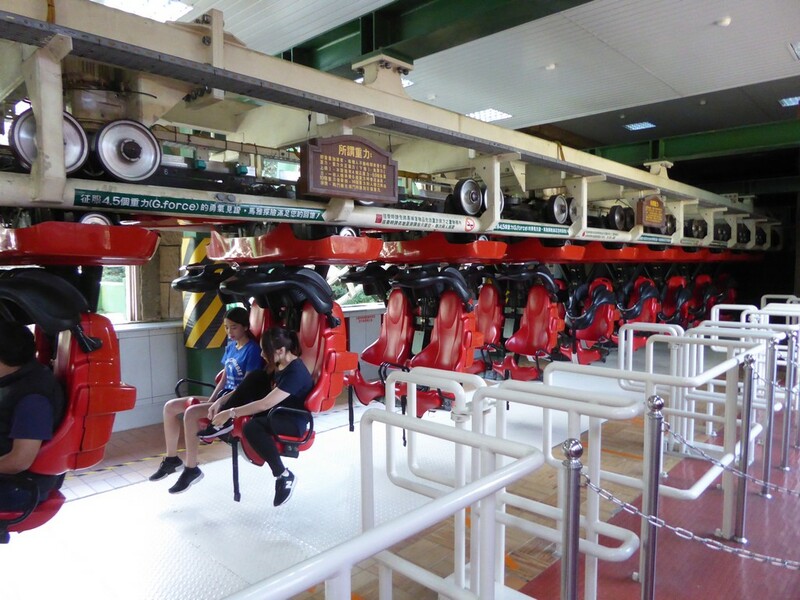 Occasionally you can chance a glimpse of the red coaster trains plying the tracks with their awesome inversions. The coaster itself is not the only discreet thing about the ride. 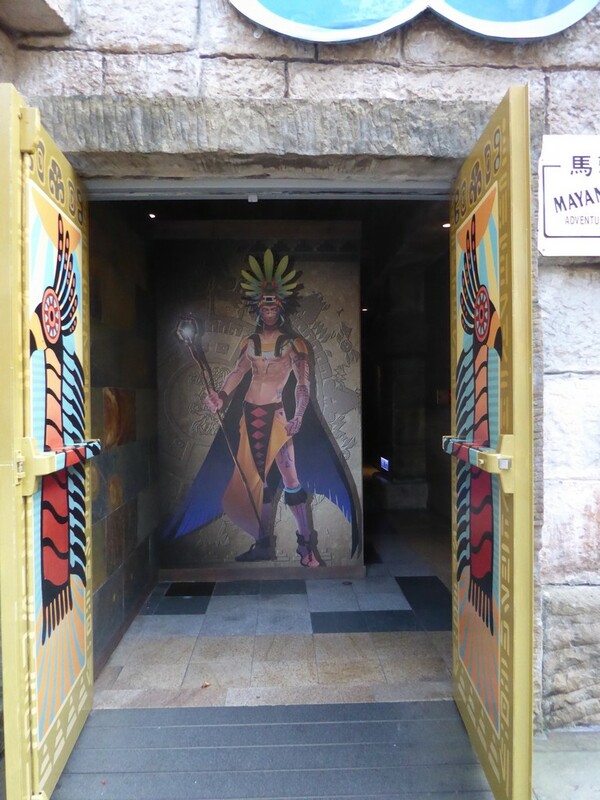 Moreover, the Mayan adventure ride entrance is also well hidden. 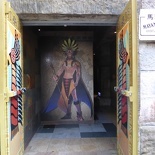 It is tucked away in a corner of the giant Mayan temple, with many people mistaking the Food court restaurant entrance in place of the actual ride. 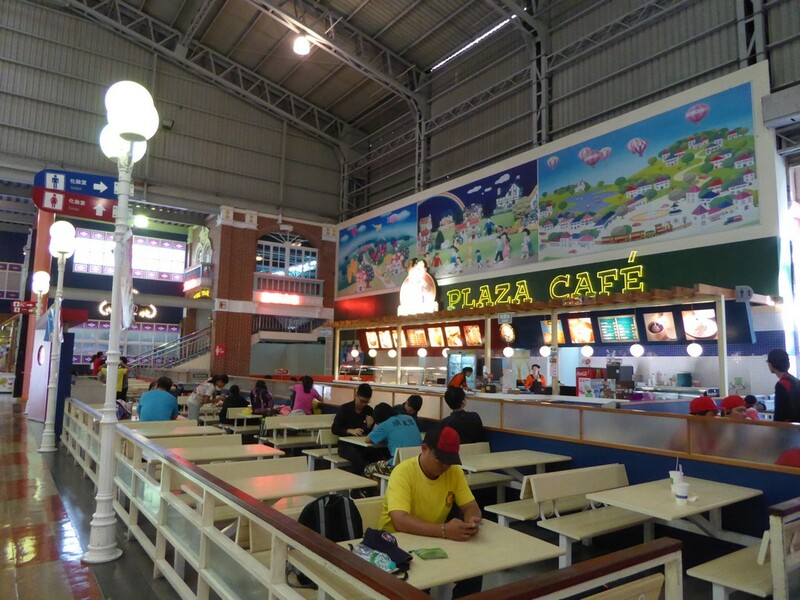 Additionally, the food court which resides in the Mayan pyramid is very nicely themed as well. 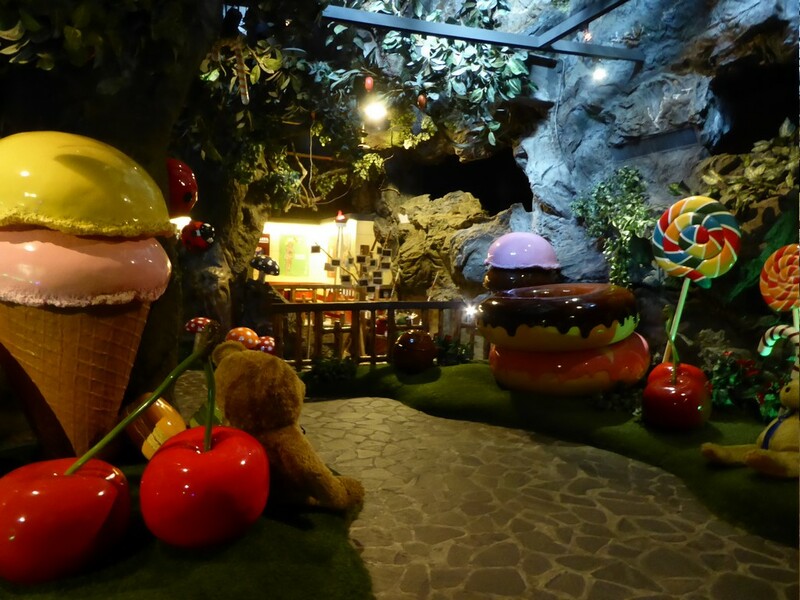 It features an extensive garden theme, complete with a playground and giant garden area with large stuffed toys, a very Taiwanese touch! Here, the coaster entrance starts off with a gantry entrance off a main road, going into an air-conditioned queue ride area. 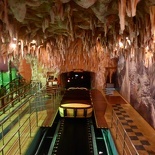 Notably, this spot is complete with interactive elements such as Audio-visual screens to keep riders pre-occupied in the queue. Not that there was a queue on my visit to begin with! 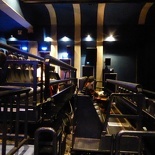 A stair climb up to the second floor brings you to an open air and largely plain ride loading area. The inverted coaster starts off with your traditional chain-lift hill climb. The view of the hill climb top offers a good overview of the park before plunging into the first drop into an inversion. 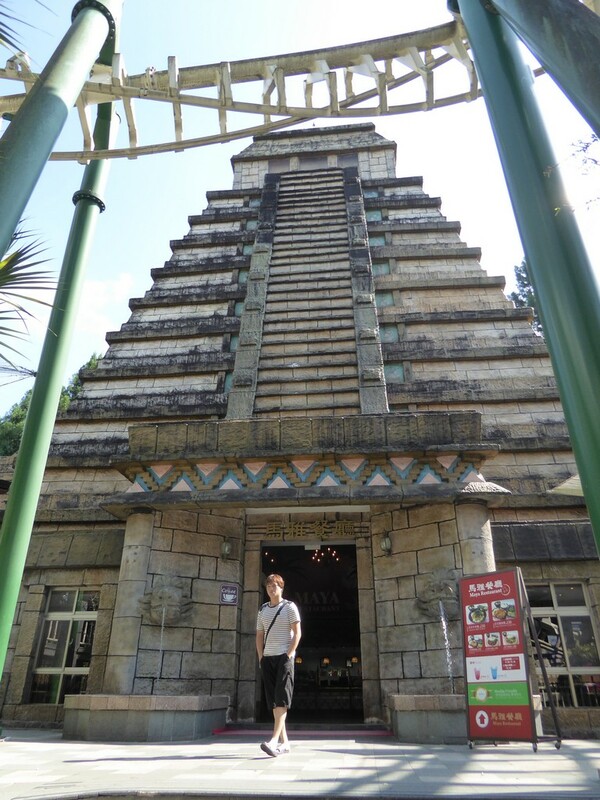 Have an on-ride video on board the Mayan adventure roller coaster! 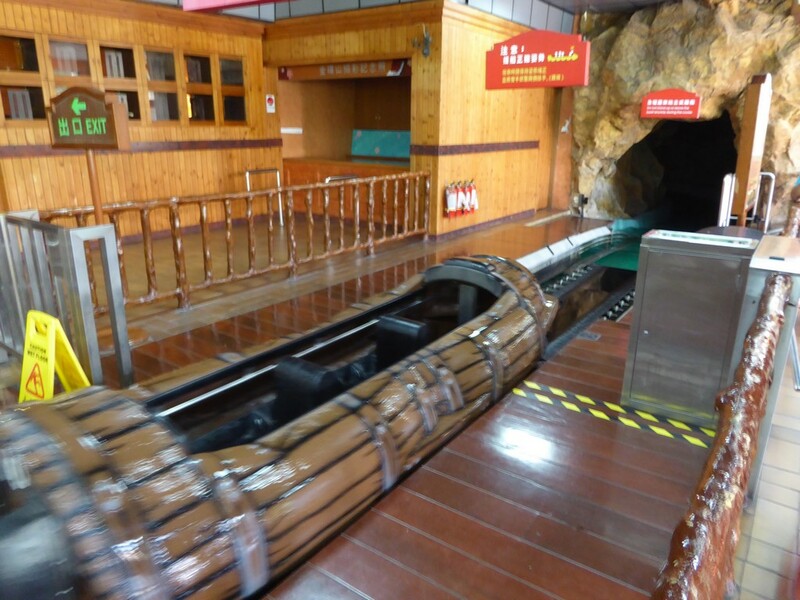 The ride is fairly stable with the exception of strong vibrations when the coaster train reaches peak speed after the first drop. Otherwise the ride is highly enjoyable. The coaster train rooms through back to back inversions. It starts with a heart-line roll, loop, followed by a half loop right over a live waterfall bound to get your feet wet! 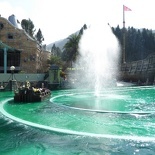 Adjacent to the park entrance is the gold rush sector and home to a traditional log flume water ride set after a western a gold rush town with a Wild West theme. 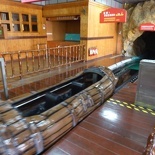 Here, the water ride is a rare log flume ride which sits up to 4 persons per floating log car. 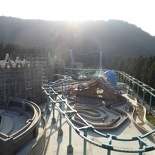 It brings riders through a lazy river with twin drops with a spectacular exterior ride theming complete with jagged hill-side which goes well with the forest background. 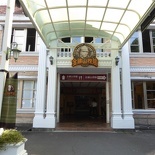 The entrance of the ride is an inconspicuous white old west house, where the Gold mine fast food restaurant reside too. 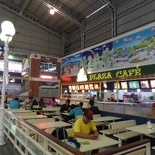 This restaurant is one of the two located in the southern Amusement area of the park. 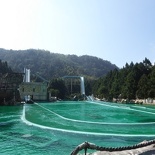 Here, the Gold mine flume water ride offers two stages drop, with several animatronic gold-miners and several points of interest along the ride water route leading up to the drops. 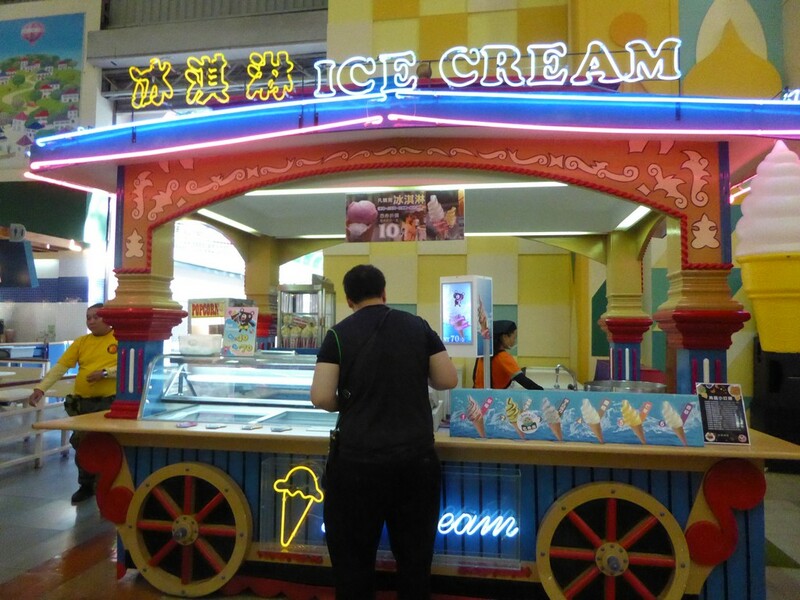 The ride even passes by the attraction connecting food court too, neat! 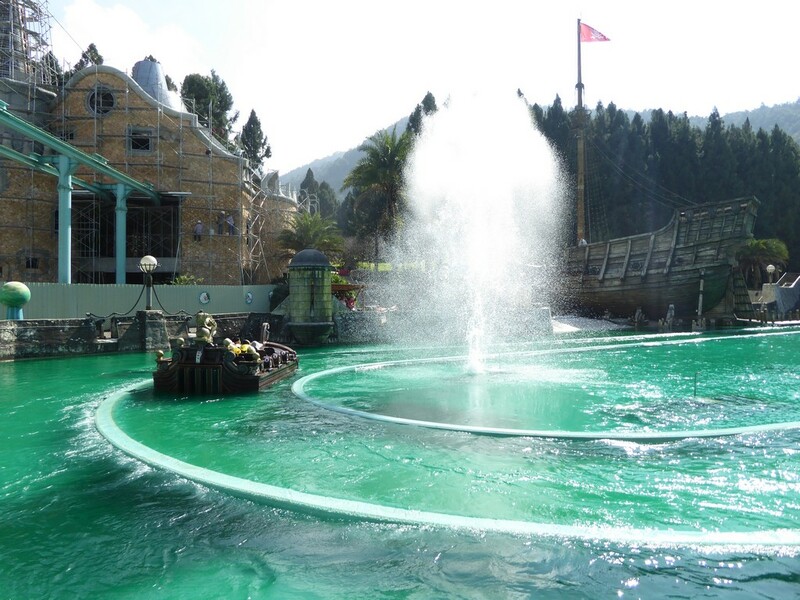 On this ride, you won’t get as wet as the Caribbean Splash ride. Hence, you will be fine without a poncho here. 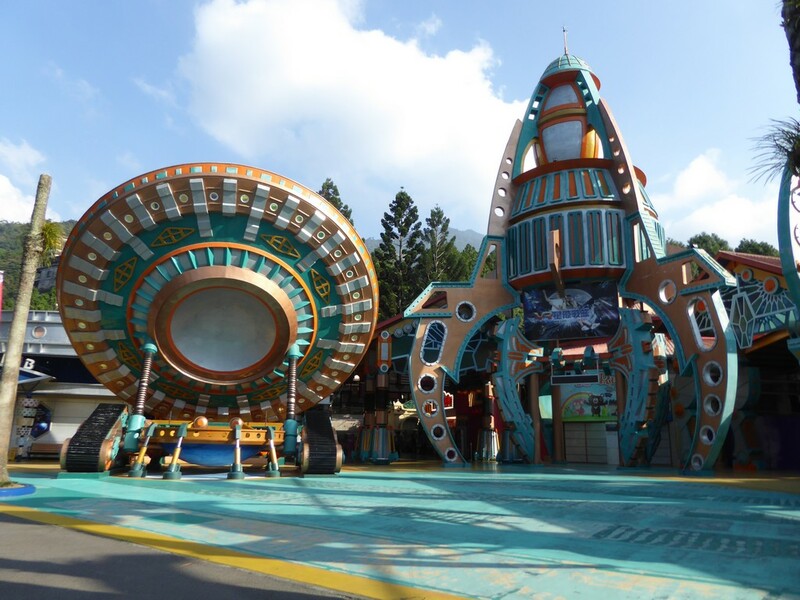 Moreover, the ride has pretty nice exterior theming too. 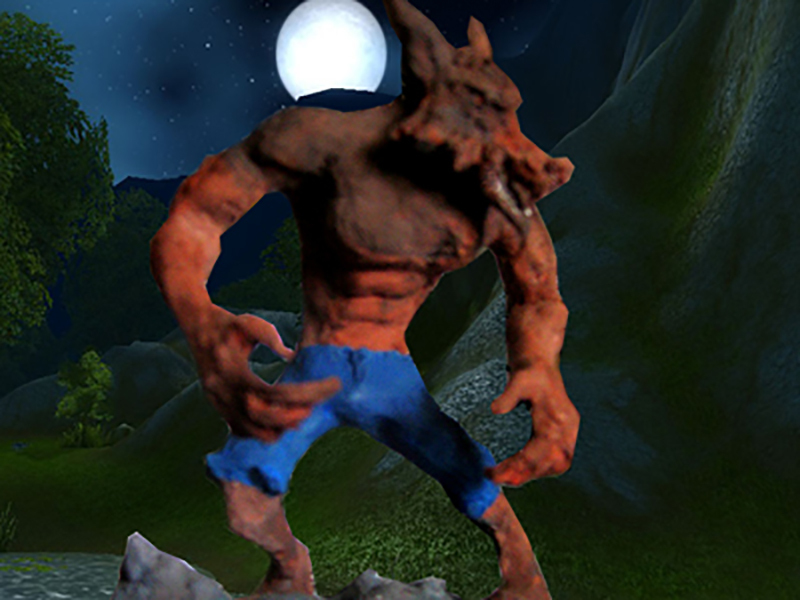 The ride grounds are cladded in a distinctive fiberglass red-rock hills like that of an ore-rich area for gold prospecting. 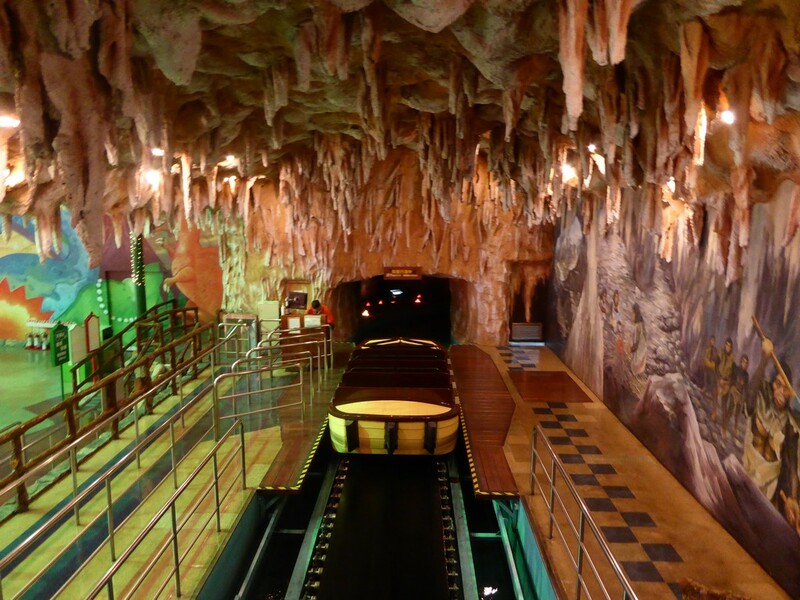 Also, the water ride various tunnels and pathways are deeply incorporated into the heart of the structure. 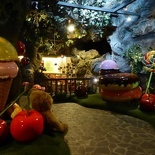 Additionally, some parts of the rides alternating between the indoor “mines” with the animatronics and outdoor sets. 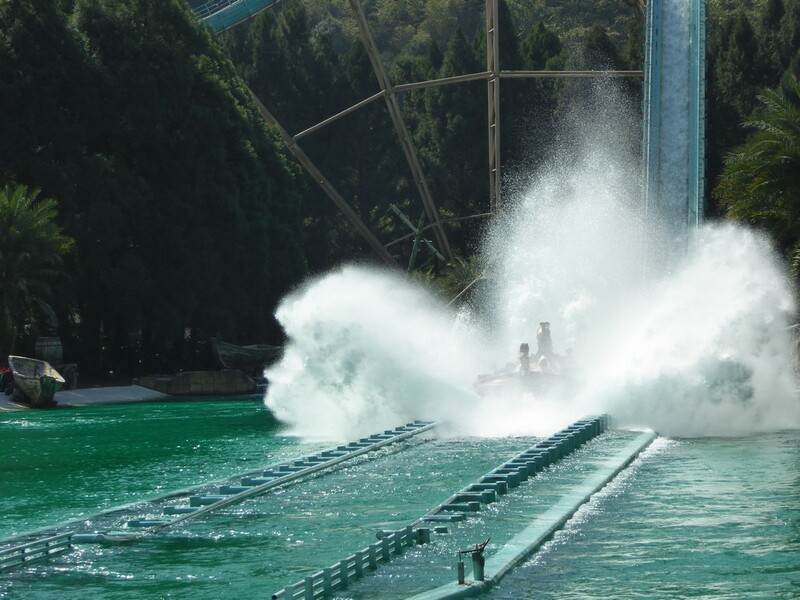 Undoubtedly, like with all final log-flume ride drops, you will be greeted by an overladen of “warning and out of bounds” before your final drop. This includes an overload of signs on your conveyor hill climb up, followed by an eventual splash down. 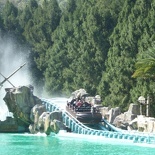 The first drop is a short climb and splash, with the final drop being twice as high as the first, providing a great splash down at the end. 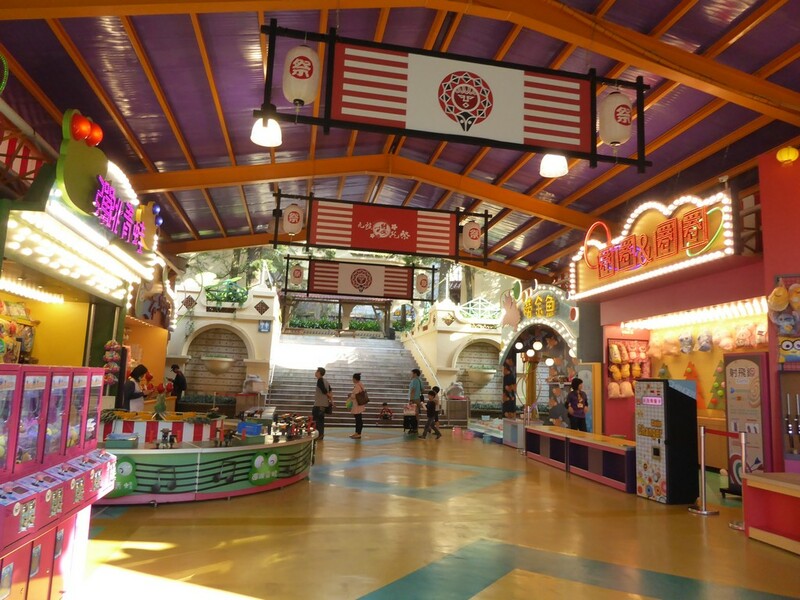 There are two restaurant food courts in the amusement center, as briefly mentioned beforehand. Each is nicely hidden in themed ride buildings. 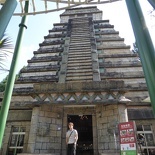 The Mayan restaurant is located in the Mayan Adventure roller coaster building compound where the coaster track dominates. 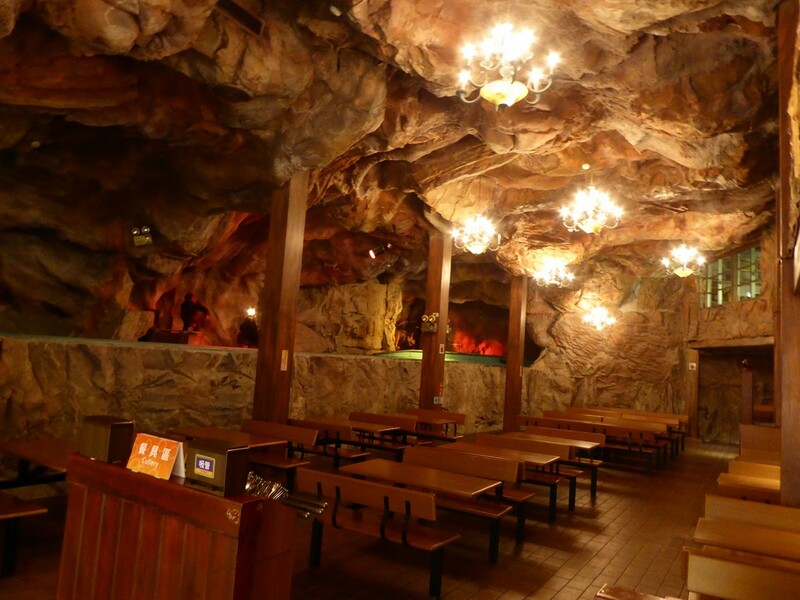 Correspondingly, the Gold mine restaurant is located in the Gold mine adventure ride. 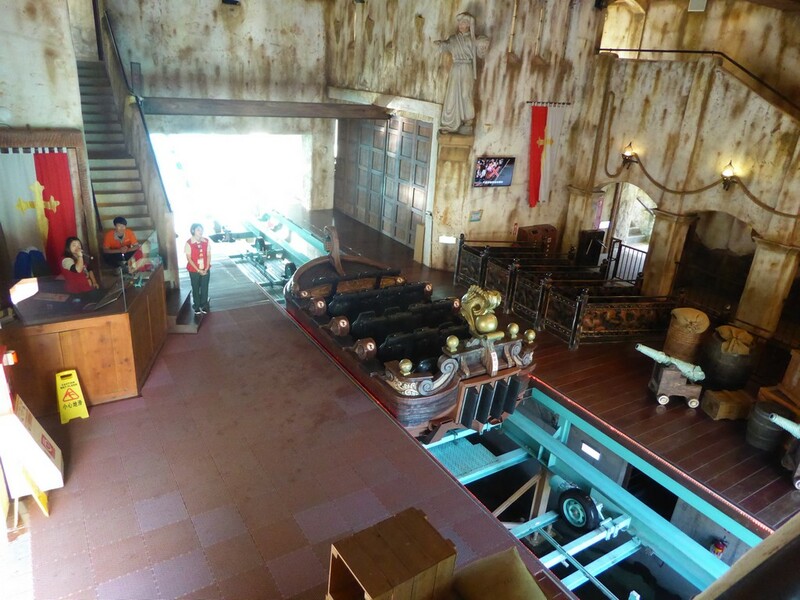 You can see the food court as the Mayan Adventure train then enters its final brake run. 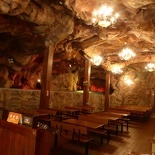 Interestingly too, the Gold mine adventure passes by the length of the Gold mine restaurant just after departing the ride station. 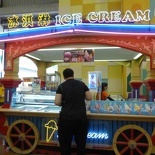 Furthermore, I found the close coupling of track/ride elements to park amenities, such as food courts rather pleasant. This rather distinctive integrated design trademark of the big rides in the park can only be found in few parks around the world. One example will be Disneyland. 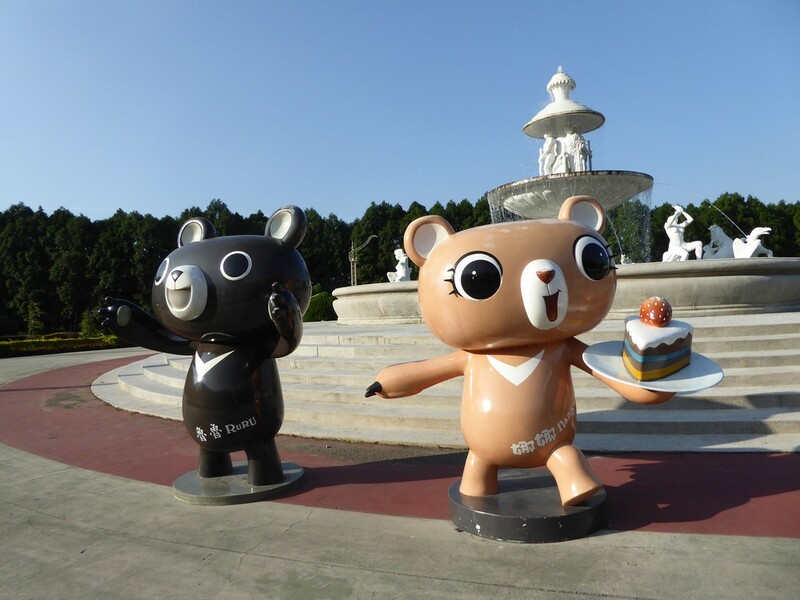 It will be unsurprising that is where the park found design inspiration from. Implementing a standalone ride is easy. 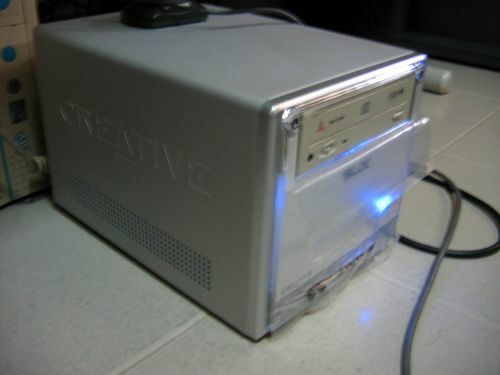 But having one nicely integrated is a neat touch and show attention to detail. 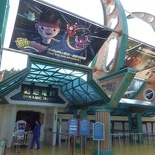 Right at the park’s south entrance is The Aladdin center. 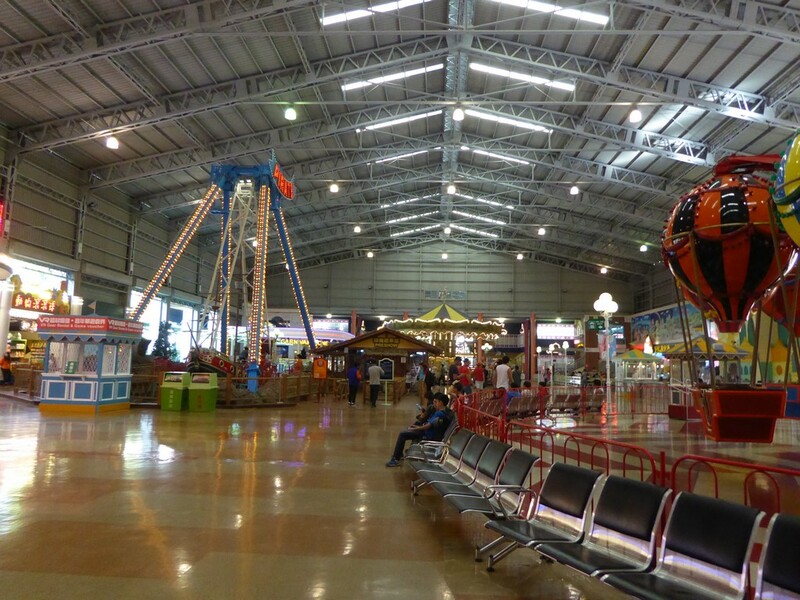 It is a sheltered large warehouse hangar-like structure housing several miscellaneous and flat amusement park rides. I believe the consolidation of rides here aims to make this sector of the park more “weather resistant”. 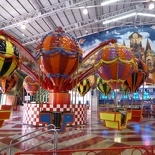 In addition to a restaurant cafe, the number of flat rides includes a line of family-friendly and carnival themed rides, such as a a couple of jumping towers, a tea cup ride themed after a demolition derby. 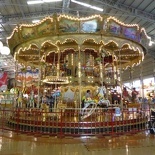 Notable rides in the amusement center also includes an elaborate double storey merry go round carousel, as well a small Viking ship. 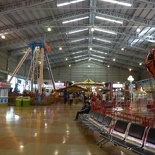 Here, a number of arcade and several carnival game stores can be seen littered throughout the center grounds. Also, there are a couple of notable large circuit rides here, namely an indoor dark roller coaster called “Space mountain”. 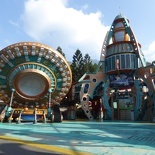 It possibly took motivation from the Disney Tomorrowland ride equivalent, even with the ride loading station very strikingly similar to that of Disney’s. The Space mountain ride will try to sell you the rental of VR goggles of an additional $50 NT to wear on board the coaster touting to offer a “realistic Virtual Reality (VR) experience”. However, I found the indoor dark coaster itself is best enjoyed without the VR headset. 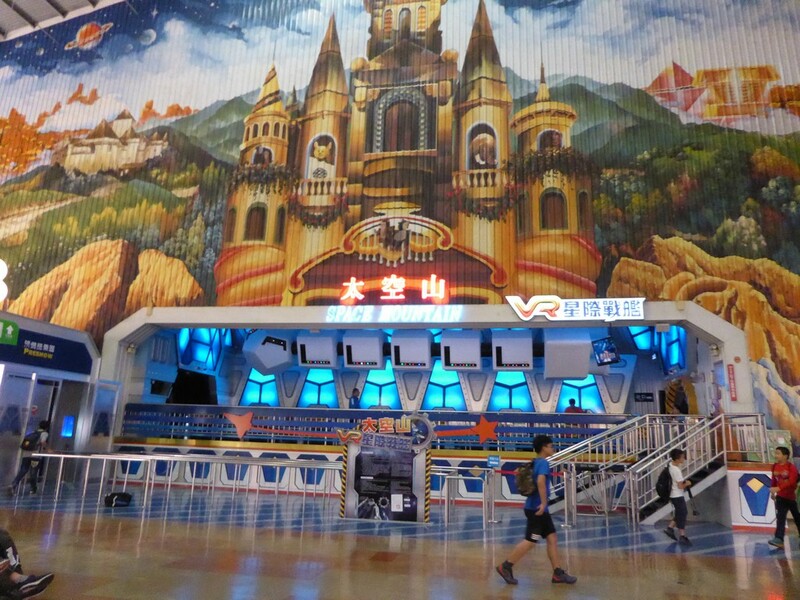 Inside, without the VR headset, you can see stars, planets and the coaster tracks inside the indoor part of the ride. Despite the VR option being touted as the “better option”, I found the ride very enjoyable without them on. 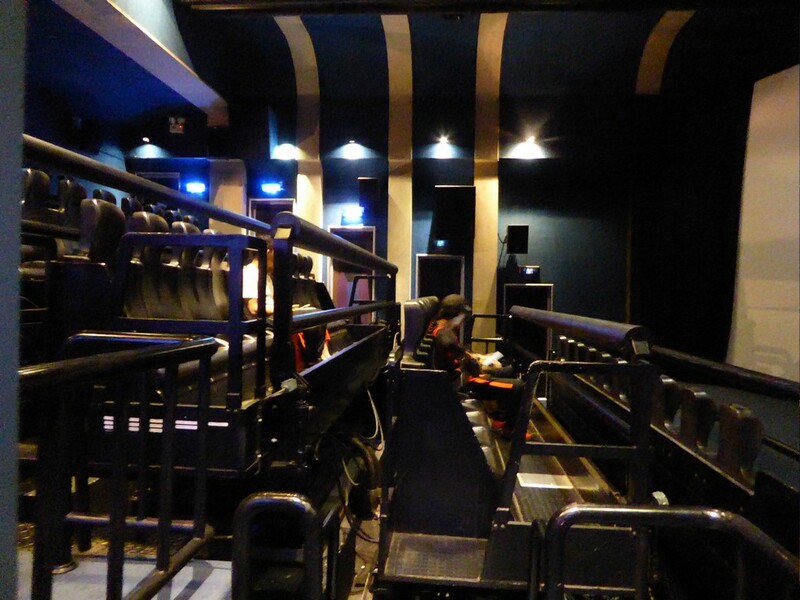 Moreover, the VR set might might induce motion sickness on riders too. 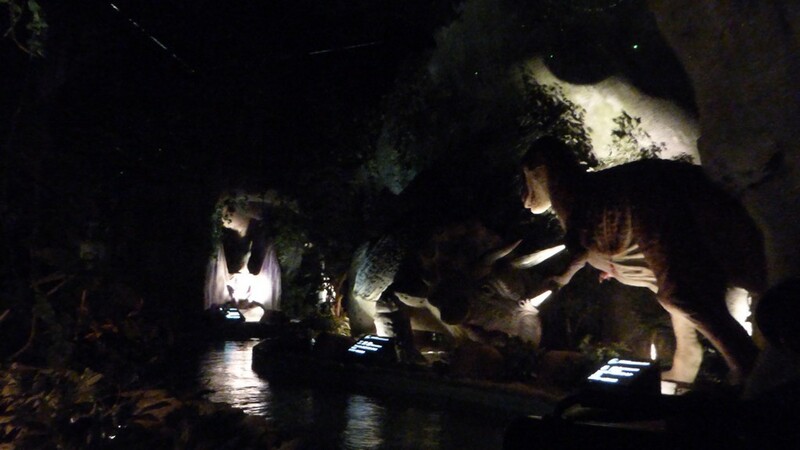 Furthermore, there is also a slow moving river ride called the Jurassic river ride. 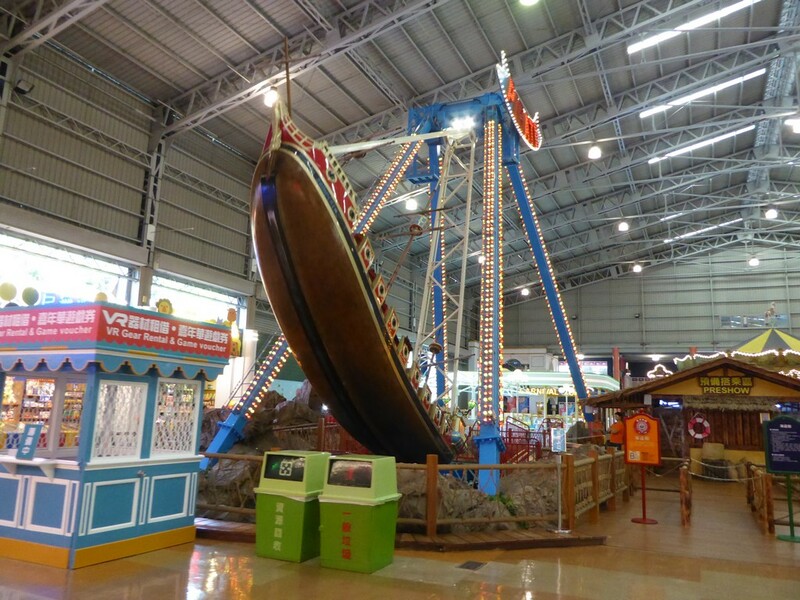 The ride is an educational boat family ride which runs you through a lazy river bringing you into a prehistorical setting. 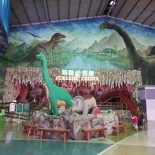 Inside, it passes by several animatronic dinosaurs. 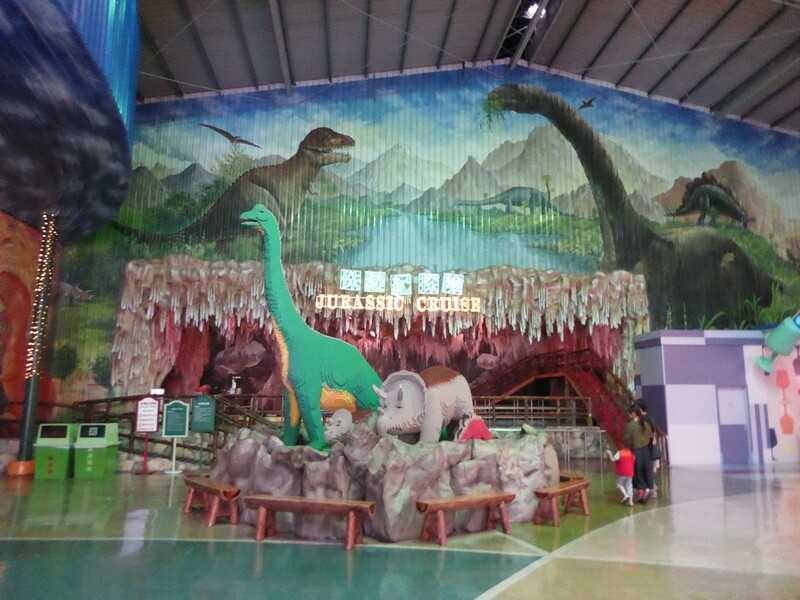 Additionally, there are lit signboards at each point of interest along way telling you the dinosaur species. 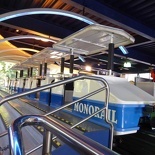 Moreover, the water ride shares the same floor area with the Space mountain ride, which is built overhead. 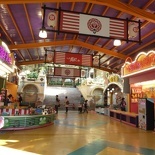 Amazingly too, the Amusement Center family Monorail ride system also runs through this sector of Aladdin complex. Notably, the train passes right through the roller coaster dark portion of the Space mountain ride too, impressive! 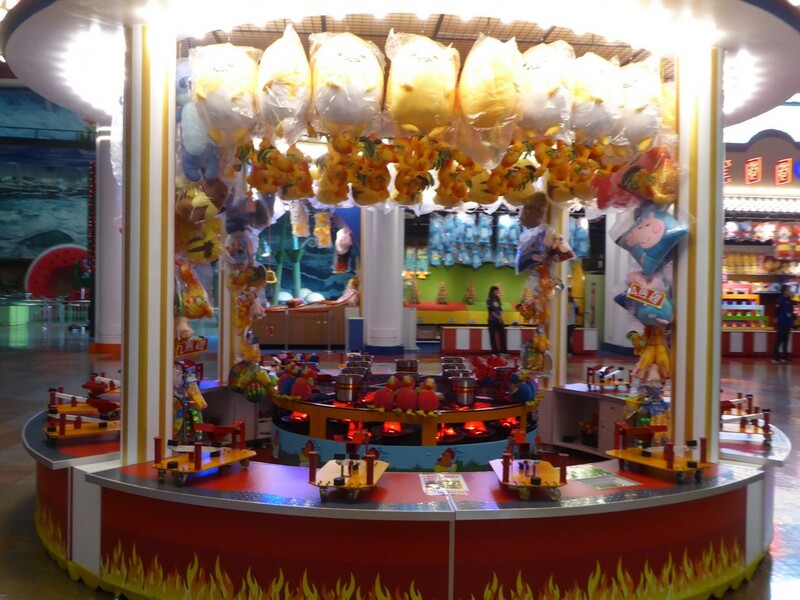 Also, the Aladdin center is laid out as an open fair ground, with the added benefit from shelter from the elements. 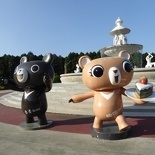 The park uses the center as an open performance area too, where dressed mascots can be seen roaming the grounds here. Moreover, at fixed times of the day Aboriginal performers will make their rounds in the Amusement Center, performing dances or rituals to that of the old days. 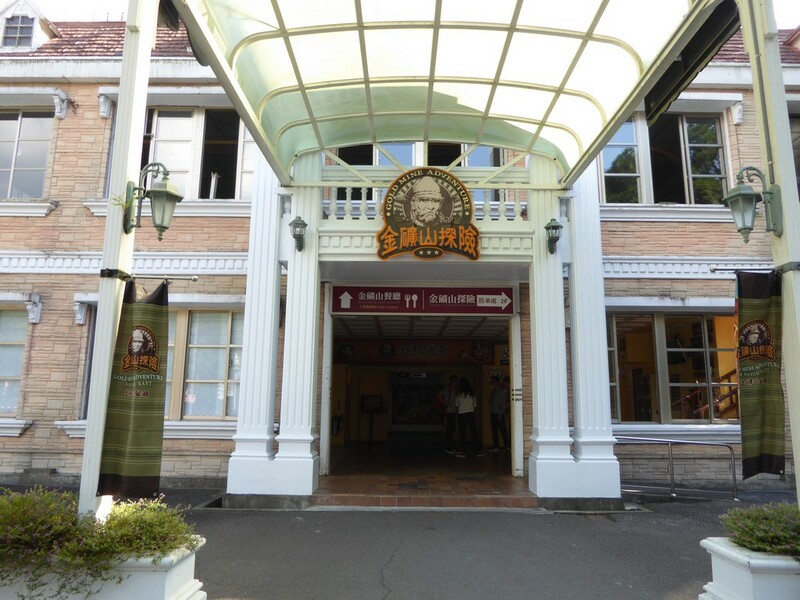 Besides engaging the theme park crowd and involving park guests in their dances, the entertainers also distributed small cups of traditional drinks (alcohol) for interested guests to try too. However, it is not that you can get drunk on those! 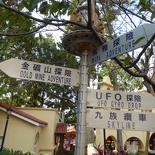 Moving on, the last sectors of the park is the Adventure Isle, Cultural Fair building and European garden at the southern-most point of the theme park. Notably, this locality is where the park’s main (southern) entrance is located as well. 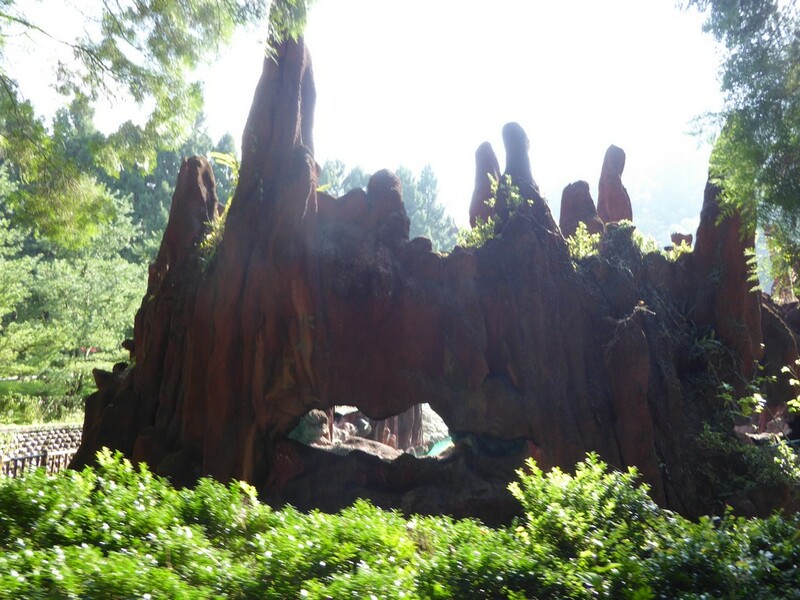 Moreover, the adventure isle is a small space-themed area which forms the welcome area and entrance to the park’s ride. 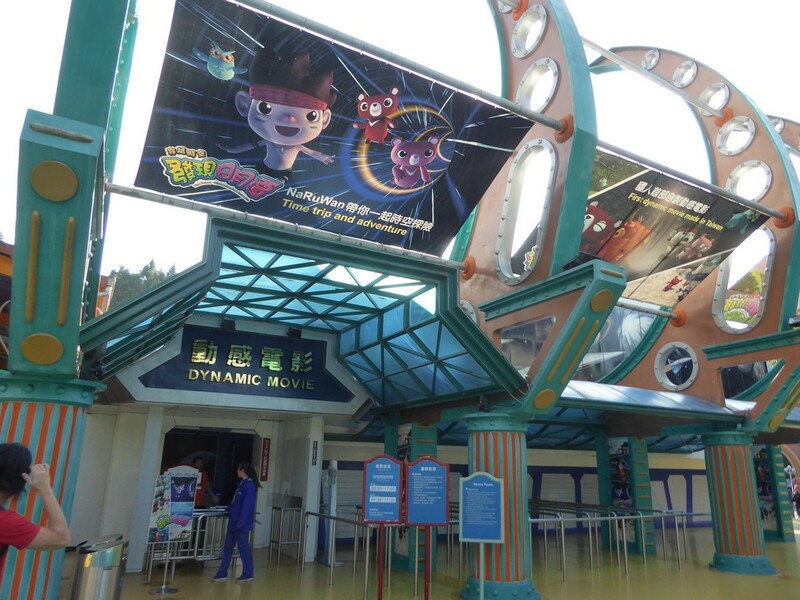 This is where the 4D motion ride is located too. 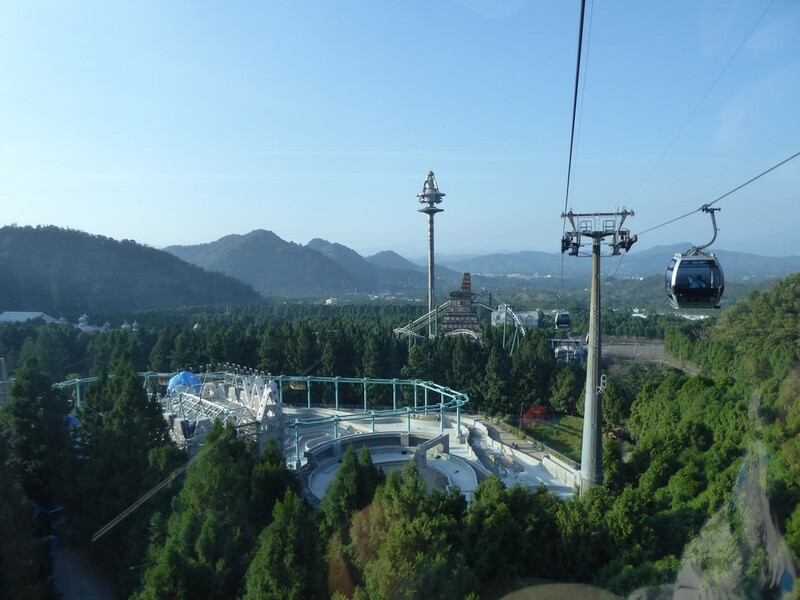 Also, this sector is where you can catch a return cable car (skyline) ride from one end of the park to another. 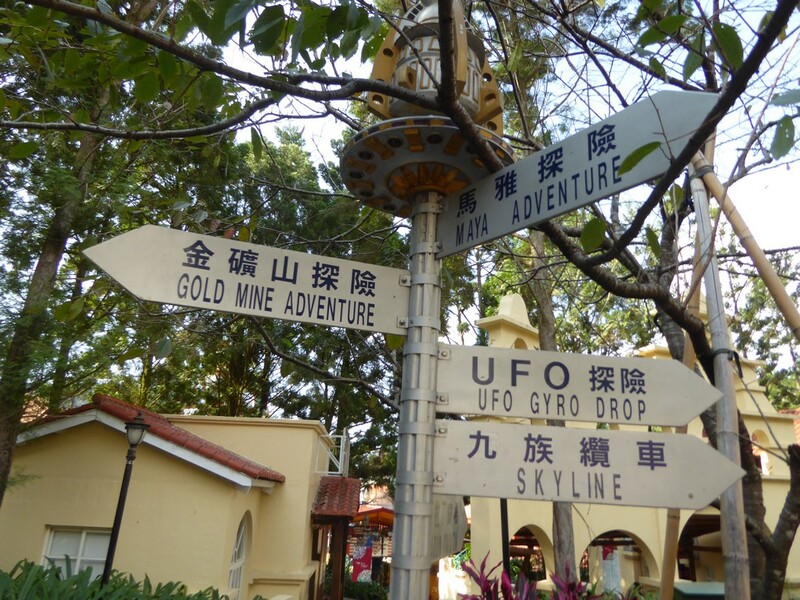 A good alternative to the UFO drop ride offering good overviews of the theme park. 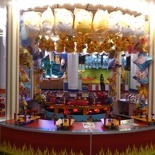 Additionally, adjacent to the Gold mine ride is an assortment of various flat rides, as well as rows of stores selling merchandise along the Adventure isle. 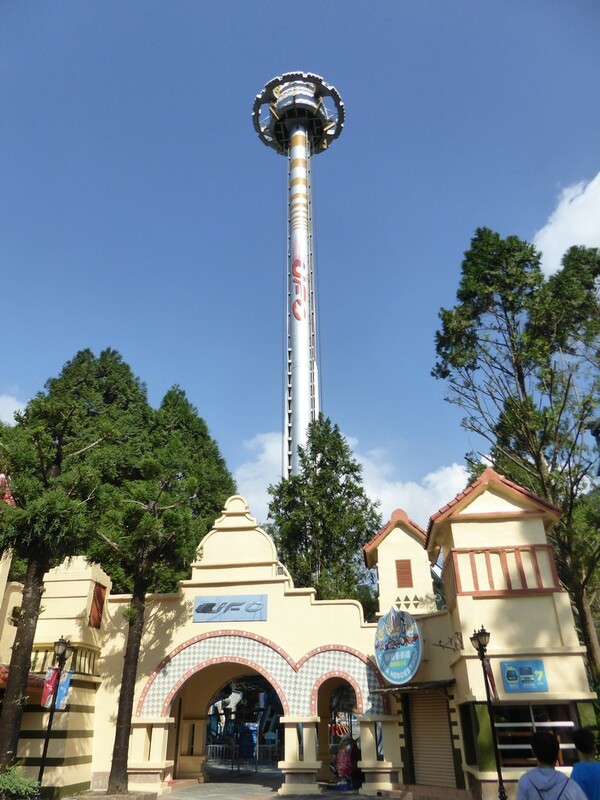 Here, one such ride is the UFO drop tower. 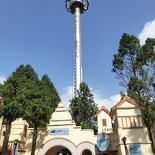 The ride is a free fall drop tower themed after a UFO on the stick. 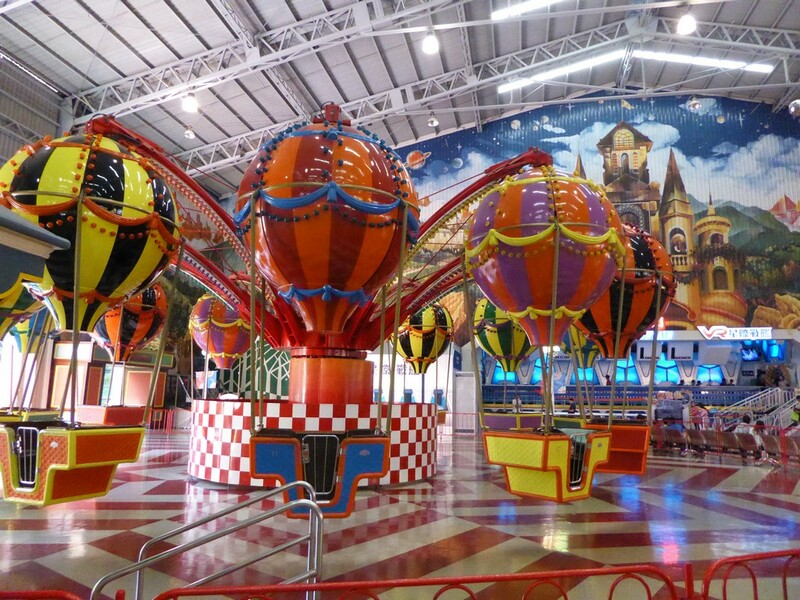 It is located in the Futuristically themed Amusement Isle sector which is also home to a 4D adventure ride. 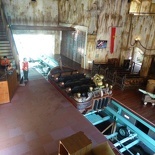 Notably, the ride is an indoor three tiered motion simulator set in a cinema building setting. 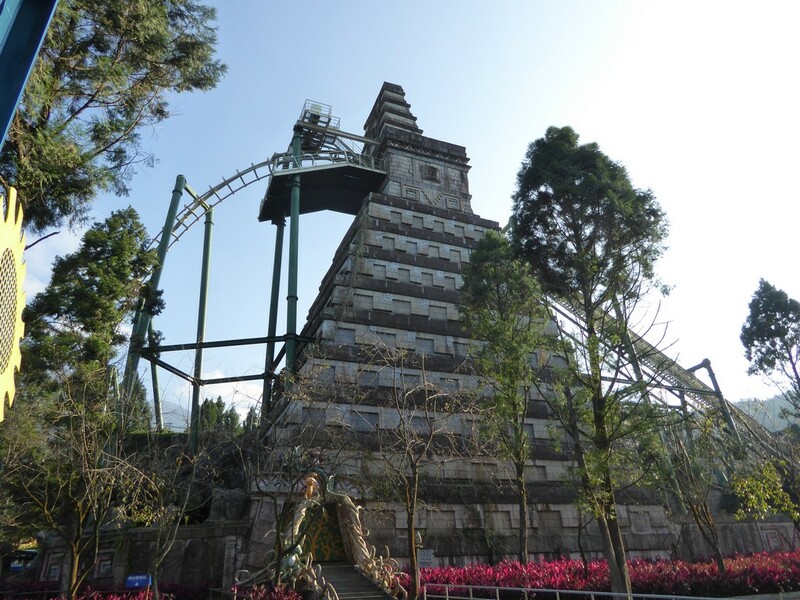 Here, the ride brings riders on a Taiwan adventure through the Aboriginal village. 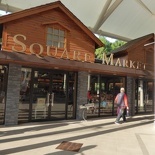 The Cultural Square is a large Aboriginal-themed open visitor welcome center at the park entrance. This large open space is a popular place for tour groups to convene. Additionally, this area connects directly via a staircase to the European garden. Undoubtedly, the gardens feature a rather well-manicured lawn with ornamental hedges centered with a white marble-like roman fountain. 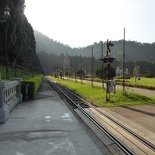 A slow moving electronic “steam” carriage train running on tracks circles the exterior perimeter of the garden. Unquestionably, it does not do much but just encircle the entire perimeter of the garden and won’t actually bring you anywhere. Surprisingly, walking might be in-fact faster than taking the train, unless you have time to kill. Here, the pure-white marble central fountain is themed to that of a roman battle scene. The fountain was recreated to look like an ancient fountain sitting squarely at the center of the gardens. It leads to four separate sides of the rectangular garden. Moreover, it has water sprouting out of a central fountain bowl. 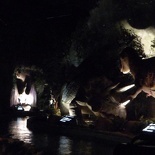 Notably, it has various mystical and Greek statues of interest placed on all 4 corners of the fountain. Notably too, at the far end of the garden is the Ritz Palace. It a white European house is home to a fine dine-in restaurant. 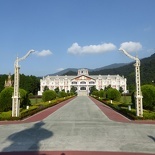 The Palace sits at a far end of the garden. 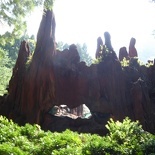 Notably, if you enter the park before 11 am, you will have more than enough time to cover the entire park. 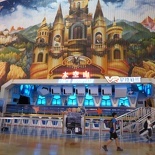 Hence, allowing you to catch performances and go on all the favorite rides at the theme park in time for the 4pm cable car station closing time. 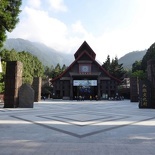 All in all, you are good at the Formosan Aboriginal Culture Village for 6 hours in total. 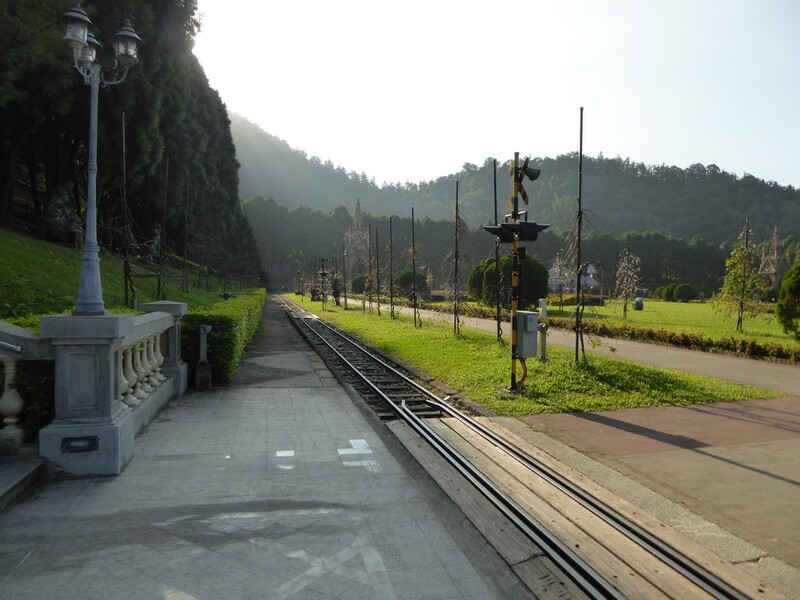 Henceforth, the park is a good way to spend an entire day if you have time to kill while visiting Sun Moon Lake. 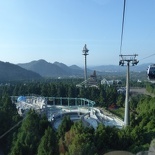 The combination of a cable car ride, as well as the views it offers of the lake makes your visit worthwhile. 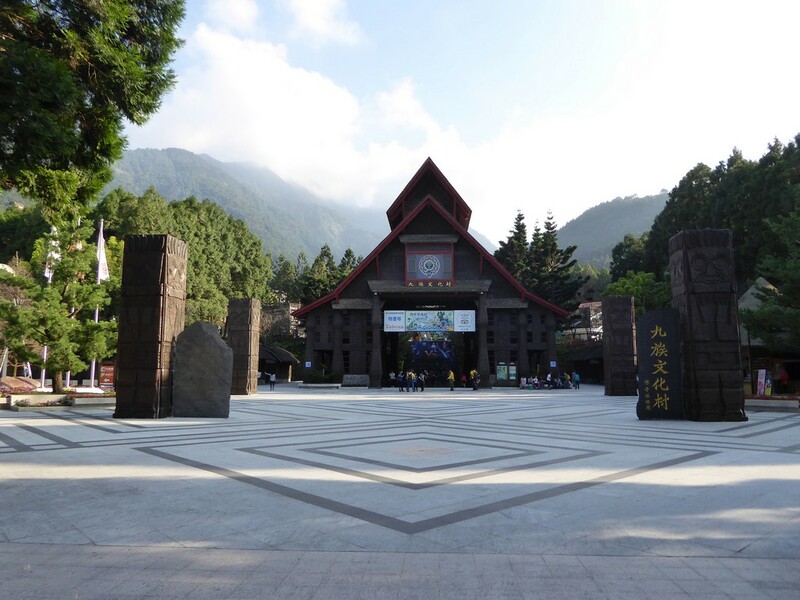 Henceforth allowing you to appreciate and learn more of the Taiwan Aboriginal way of life. 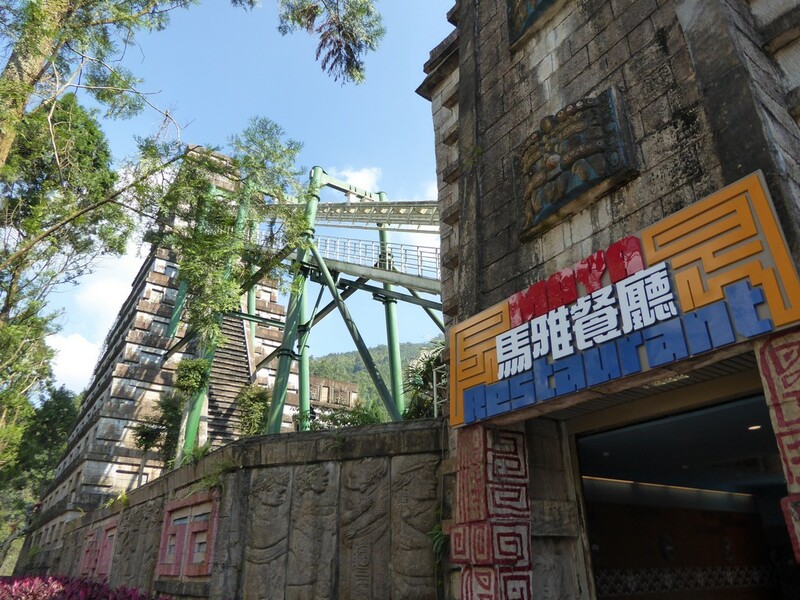 View more photos of the Formosan Aboriginal Culture Village in the photo album here.